The Abu Dhabi Occupational Safety and Health Center has completed more than 2000 hours of field visits and awareness-raising within the framework of the Safety and Freedom Program, which was announced in conjunction with the start of the no-work period during the afternoon between 15 June and 15 September. The Centre's free safety Programme for the fourth year aims to provide the necessary information to employers operating within the emirate of Abu Dhabi has high temperature workers, including the weather (working in outdoor places directly exposed to the sun or in an open space exterior exposed to the sun in hot weather) and thermal processes that take place within the work site ovens or lighting and other process that are characterized by high temperature by helping and directing employers to understand and implement the thermal stress management programme, and to ensure proper control measures to protect workers from exposure to sunlight. The main points of focus in this period are the provision of shaded or cold resting places during working hours, and the provision of cold water and liquids enough for the workers, and provide the required training on the identification of the tasks needed when dealing with the risks and situations of thermal stress and necessary medical assistance. In cooperation with the Abu Dhabi Emirate, the Center provides awareness materials to raise awareness among workers of all safety requirements in the Free Zone, which in turn organizes internal awareness workshops for its employees, supervisors and staff. A 6-language awareness leaflet was distributed to nearly 7,200 organizations for maximum benefit. The safety program, which began in June 2017 and continued until the end of September this year, included the distribution of 100 thousand awareness materials to the various actors, which includes approximately 600 thousand workers. The Center called on them to make use of the awareness materials available on the page And the participation of the Center in their experiences in raising awareness. The Center annually publishes these experiences and stories, honoring the participating parties, and announcing the winners of the safety program competition in Alhor to be held in October of this year, and has visited the program page since its launch in 2015 about 2400 beneficiaries of the publications and free training offers available in Location. Within the framework of the activities of the safety programme, more than 300 awareness-raising workshops and 250 inspection and inspection visits were organized for more than 300,000 workers through the working parties in the principality have covered various activities such as energy, transportation, construction, establishment, industry, tourism, health, food and waste, among the most important. For visits by the centre, he visited the construction site of Sheikh Shakhat Medical City, one of the most important development projects in the health sector and in support projects and another awareness visit to the residential city of the construction workers in the Mafraq district, one of the labour cities of the Supreme institution of specialized economic zones. in addition to participating in awareness-raising workshops for both real estate and services management company and presentation of an awareness-raising and participation in the workshop for the safety in the free program organized by Khalifa Industrial City (Kizzad). In this context, many governmental and private entities have contributed to the Center's efforts over the past years. This support is ongoing. They have organized lectures, workshops and distributed awareness leaflets, most notably the Municipality of Abu Dhabi City, Western Region Municipality, Al Ain Municipality, The Abu Dhabi Airports Authority, the Abu Dhabi Housing Authority, the Abu Dhabi Education and Vocational Training Institute, the Telecommunications Regulatory Authority, the Abu Dhabi National Exhibitions Company (ADNEC), ADNEC, the Ministry of Health, General Study of the zoo and aquatic eye, the center of farmer services and industrial complex balance and Abu Dhabi Polytechnic. On the other hand, some authorities have developed an annual program on safety in the free, and the provision of educational materials and educational supervisors and workers in several languages, most notably ADNOC. 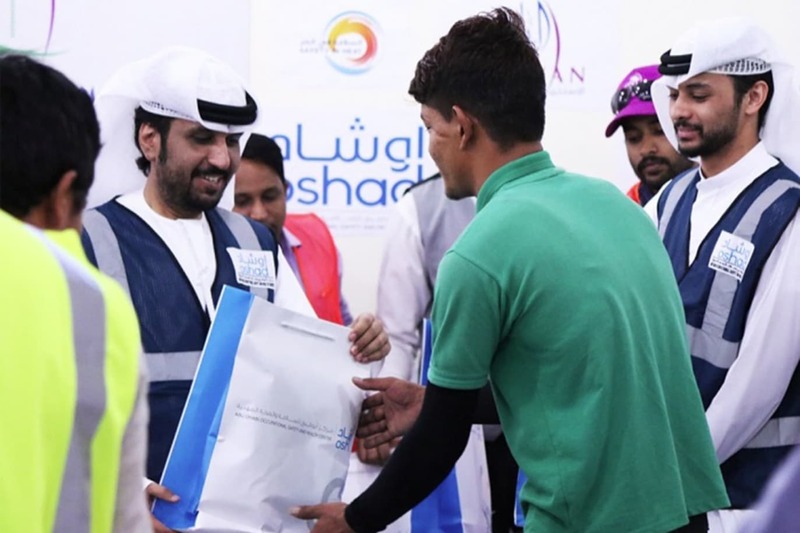 For the second year in a row, the Safety in Free Competition, organized by the Center in cooperation with the Higher Corporation for Specialized Economic Zones and Abu Dhabi Public Services Company, continues to support the aim of raising awareness and promoting a culture of occupational safety by covering 30 labor cities inhabited by approximately 380,000 workers in economic zones. A total of 63 projects have been completed in cooperation with Abu Dhabi Public Services Company (ADSSC). The best labor city / construction project and best worker, the best city / project in the innovation category and the best innovator will be selected in October. The special assessment team prize, headed by the center and the membership of each of the Higher Corporation for Specialized Economic Zones and Abu Dhabi General Services support during their visits to the cities of labor and various projects in the Emirate of Abu Dhabi, to determine the application of the requirements of the safety program in the free, and the extent of compliance with the requirements specified by the Center, With the aim of raising the culture of occupational safety and health within the category of workers and employers and reaching the largest number of workers in one place. The Center extends its thanks to all the partners in the program, especially the Higher Institution for Specialized Economic Zones (ZonesCorp) and the Public Services Company (SANA). The establishment of an effective partnership between the Center and the government and private agencies is an inspiration that contributes to cooperation, Occupational Safety and Health in Different Employers "
In addition, the Center will seek to expand the scope of the competition to include contracting companies, factories, maintenance companies and service companies such as cleaning, security, agriculture and others. The Center is keen to establish these programs annually as the body responsible for overseeing all aspects of occupational safety and health in the workplace at the level of the Emirate of Abu Dhabi.